From Boyle Town & More page entry on boyle Bridge: A statue of William III on the bridge, erected originally in 1754 by Lord Kingston was removed to the Pleasure Grounds from where it disappeared in the 1930’s. 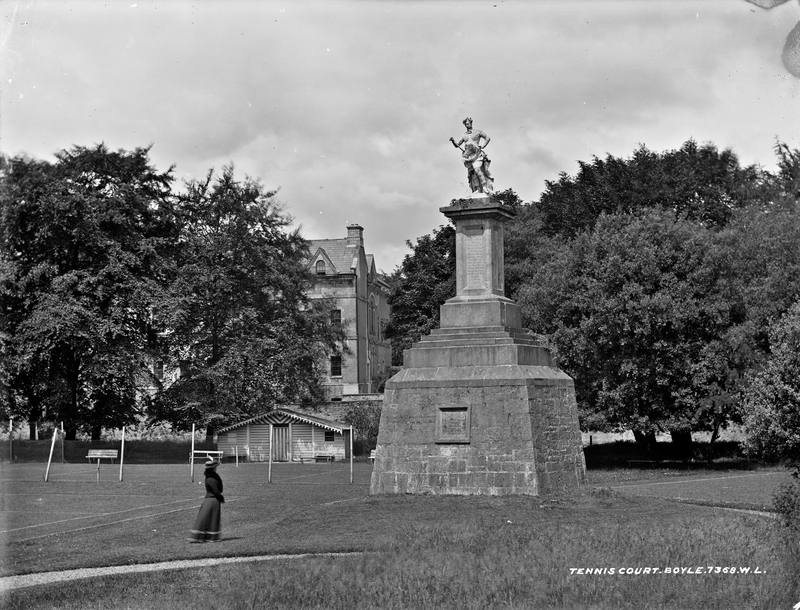 A similar shot in the archive titled King William's Statue, Boyle. King House from 1720 in the background is no help for dating purposes. Another ref: D’Alton Annals of Boyle refer to ‘a statue of King William representing his majesty with a crown of Laurel on his head and the Order of the Garter on his knee’. When the new bridge was built in 1834, Viscount Lorton had the monument moved to the Pleasure Grounds. Later ,during the ‘Troubles’ in the early 1920’s, the statue was beheaded. Subsequently the rest of the statue was removed and now only the pedestal remains. [https://www.flickr.com/photos/gnmcauley] I found a lot of images of the King William II statue with him on a horse, including one where he's been knocked over. Are you sure this is King William as well? [https://www.flickr.com/photos/[email protected]] This is King William III. He's marked on the 25" above, and named in the identical catalogue shot linked above. King Billy's statue did not receive a great deal of lurve. This is from 1905, which might imply the photo is before 1905 ? 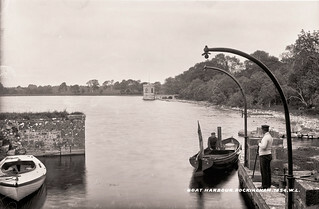 An extraordinary affair happened at Boyle, Roscommon, recently. A statue of King William IIL, erected by the first Earl of Kingston, in the private grounds now belonging to the Boyle Lawn Tennis Club, was hacked at by some men with chisels, who, after removing the head, covered the rest of the statue with tar, and finally stuck a green bough in the neck. The Lawn Tennis Club have made a claim for £200 for malicious injury, while the United Irish League has also frowned upon the action and offered a. reward for the discovery of the perpetrators. [https://www.flickr.com/photos/gnmcauley] I see what's happened. A search for "Boyle King William Statue" returns the college green statue, what with Boyle being a person more than a place. [https://www.flickr.com/photos/beachcomberaustralia] The second Trove article you link says: "Twenty years ago the head was cut off the statue, and It has remained headless slnce", so yes, that means these pics are before that 1905 attack. It almost looks like there's a conversation going on between the woman and the statue. "How's it going down there?" Mr French / Lawrence took a couple of photos of the "Military Barracks" from near the tennis club shed; the top right dormer window is in the same position as here, implying the same day... catalogue.nli.ie/Record/vtls000332568 (clearer) catalogue.nli.ie/Record/vtls000320122 He must have been experimenting with different cameras or glass plate sizes, as one is ROY and the other CAB, as with the two photos of this statue. I don't understand the technicalities, but I think it has been mentioned before somewhere? it is a big pedestal for a relatively small statue.